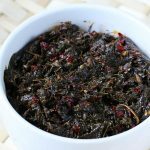 Gongura pachadi recipe or gongura chutney. Red sorrel leaves are called as gongura or puntikura in telugu, pulicha keerai in tamil, punde pale in kannada and ambaadi in Marati, pitwaa in Hindi. 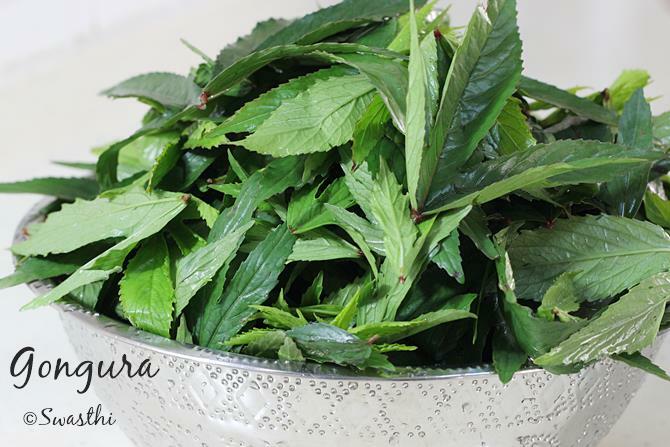 These leaves taste sour can help in alleviating symptoms of cold, cough and fever too. 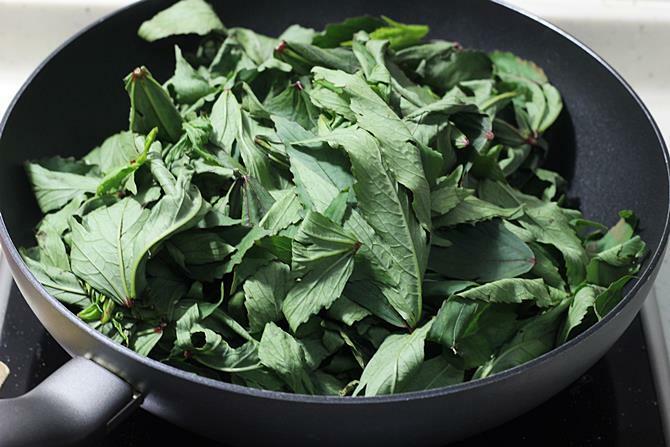 It also increases appetite since it is high in vitamin C. These leaves hold a special place in the Andhra cuisine especially in and around Guntur region. 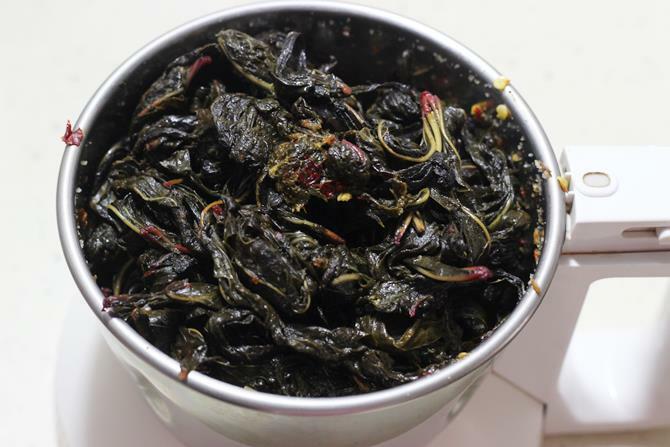 Apart from the pickle, other popular dishes are gongura pappu, gongura mamsam, gongura royalu, chicken curry and dry gongura chicken fry which are prepared with these red sorrel leaves. I am sharing 2 recipes. One is made like the nilava pachadi or pickle and the other one a chutney. To make this pachadi, i cleaned and plucked the leaves first. Then measured, it filled a 3 liters utensil (pot) when tightly packed. Washed them thoroughly few times in clean water, drained them and then spreaded them on a clean cotton cloth. The leaves must wilt off on their own and no moisture should be left. It just took 10 hours for me on a hot day. Rest in the step by step pictures. 2. 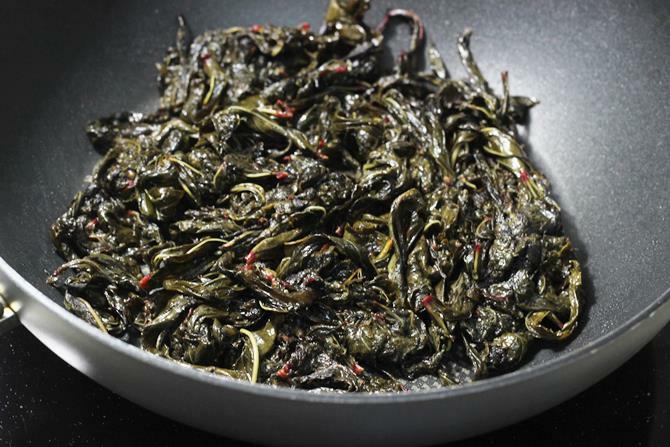 Add the leaves to the hot pan. 3. Fry until the leaves wilt off. Set them aside to cool completely. 4. To the same pan, add more oil and fry the red chilies until crisp. Switch off and add cumin/ jeera. 5. When they cool down add them to a blender along with garlic and salt.Blend until smooth. 6. Add the leaves and pulse to get a coarse texture. 7. Traditionally pachadi is made coarse. You can temper with curry leaves, chana dal and urad dal if desired. Adjust salt and spice now. 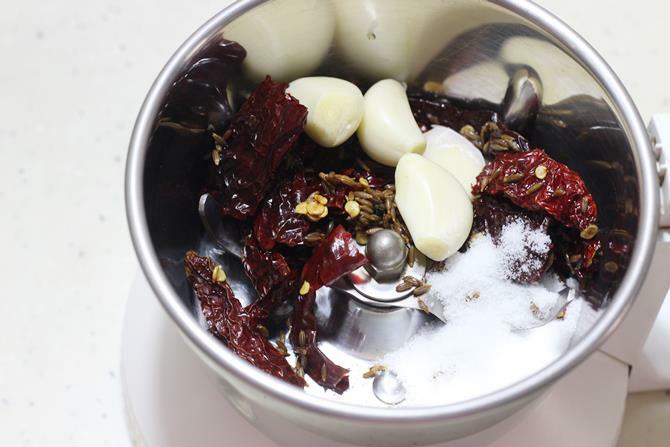 If spice not enough, fry more red chilies, blend and then mix with the chutney. This chutney is prepared in many ways, but this is how my mom prepares. Many like to temper the chutney with shrimps / prawns (crispy deep fried or tawa fried). Since my mom tempers it with Vadiyalu and majjiga mirapakayalu. You can even use white sesame seeds. If you haven’t tried with this kind of a tempering, do try. 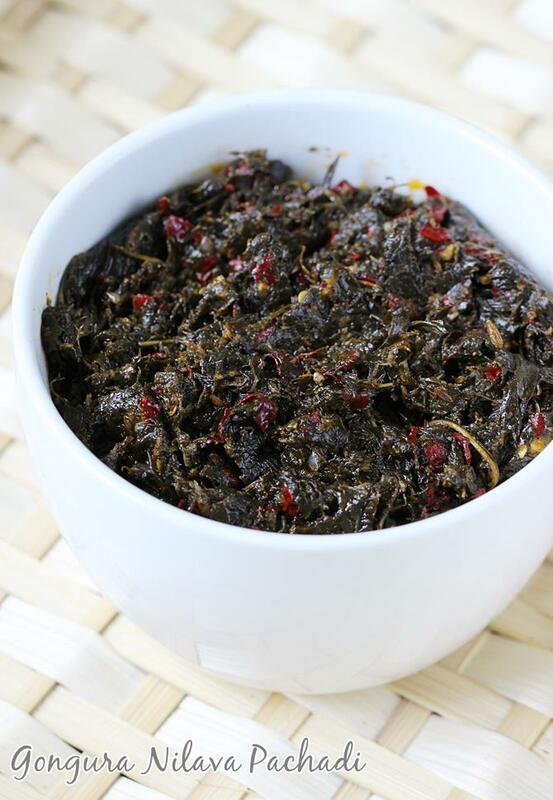 Gongura chutney is a popular pachadi made using red sorrel leaves. It can be served with rice or chapathi or dosa. Pick the leaves from the stalks and Wash them 3 to 4 times in a large pot. Drain them aside for at least 10 mins in a colander. In a large bowl add leaves, onions, green chilies and 3 tbsp water. Boil all these till the leaves are fully cooked. 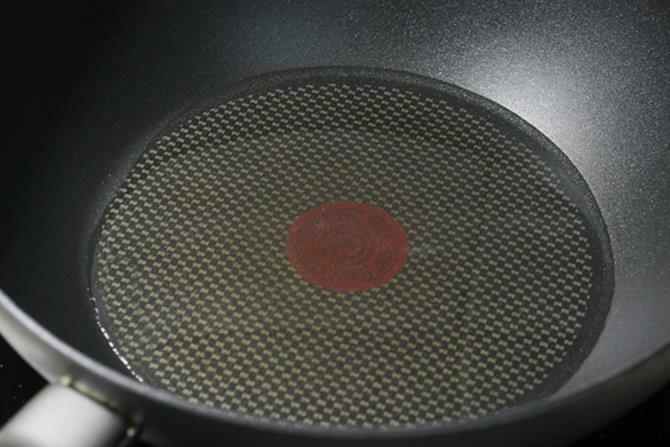 After the leaves are cooked, If there is more water left, discard it or evaporate it by cooking for longer. You can even steam cook them. Once cool, grind all the cooked ingredients with salt. Heat oil in a pan. Deep Fry majjiga mirchi set aside. Deep fry vadiyalu set aside. 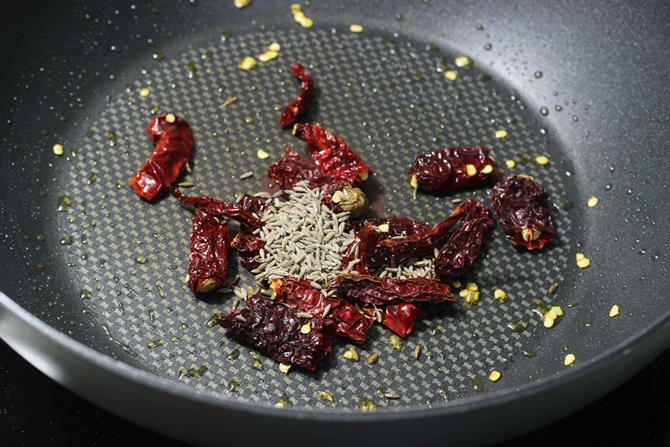 Remove excess oil and keep only a tsp of oil in the pan, add red chilies, mustard, cumin and garlic. Once they splutter. Off the heat. Mix chutney with all the fried and tempered ingredients. 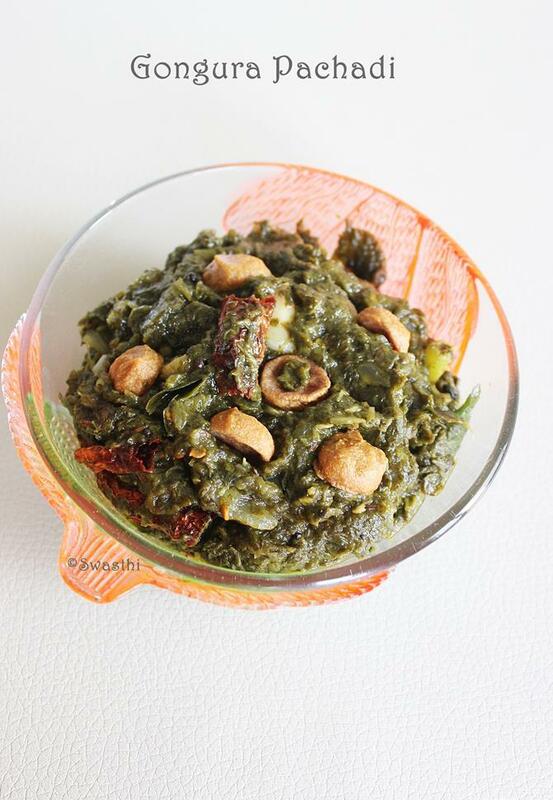 Serve gongura pachadi with hot rice and a spoon of ghee. thanks swathi garu.mee receipes naku chala use avuthunayi. I found them at my supermart after reading about the health benefits of sorrel leaves. I cook the chopped wilted leaves with some pounded red chillie and red onions then seasoned with salt and some sugar. The tart taste of dish is very appetising! Since I cannot eat rice, I ate them with bread instead – yummy. I am also learning to make the paratha. Tq for your other gongura recipes. I am looking forward to cooking the gongura chicken fry and pappu recipes next to eat with paratha/capathi. Glad to know you have tried sorrel leaves. Yes the health benefits are immense. Do try the other recipes as well. 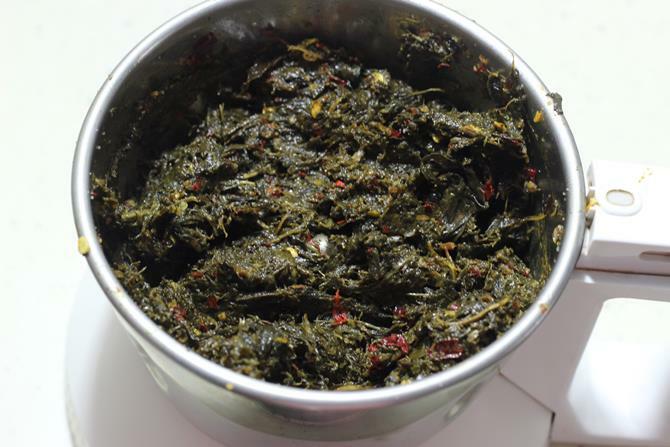 You can also try shrimp with gongura, the same way as gongura chicken fry. Thanks for the feedback. swathi garu me blog chala bagundhi. healthy and delicious recipe… bookmarked.. This is new to me. Looks delicious and inviting. This pachadi is new to me 🙂 Sounds flavorful Swasthi!! The leaves are new to me, maybe I have never noticed it before. Will try to look for it in the market.<br /><br />Its about simplicity but I sure love the fragrance of curry leaves and that bit of chili.